We own a 2003 Newmar Kountry Star. Keith, Chaplin, and I love our girl, and we have proudly named her the "The Golden Snail". How did we choose such a title? The name originates from one of the most adventurous and beautiful children's books I have ever read. It is The Legend of the Golden Snail and it was Chaplin’s favorite book when he was two. In fact, at 2 1/2, he could recite the entire book from memory! Our family has read this book so many times that "The Golden Snail" instantly came to mind when we thought of naming our new 40' home. Yes, it is cheesy but people do name their RVs! The Snail comes equipped with two slide outs for a roomier feel in the coach. It does actually feel much bigger when the slides are extended. One slide is located in the bedroom and allows us to walk completely around the bed. I know that sounds silly but being able to easily move around in one's bedroom is quite the convenience. We can take sheets off and put them on with ease! Our bedroom has what I consider, lots of drawers and cabinets for all our "junk". 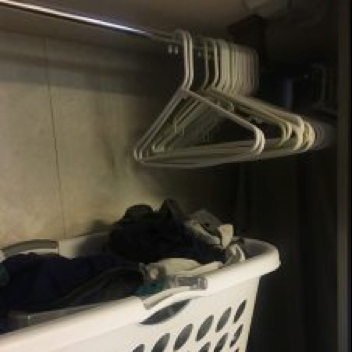 We have a sliding door closet where we store hanging clothes and two deep hidden compartments for stashing stuff you only need once in a while...or for items, you cannot fit anywhere else. This is a common and ongoing issue! It is almost impossible to take good pictures of anything inside "The Golden Snail" because the spaces are tight, but unbelievably, this closet holds hanging clothes, two large bins for toys/books, the clothesbasket, and those hidden spaces are on either side of the closet. These have proven to be highly useful repeatedly. The best part is the bedroom has it's own privacy door! I know, I know...everyone is filled with envy at this point. Moving forward, prepare to enjoy the expanse our bathroom setup. Our coach has a large shower. Remember "large" is relative to what you are comparing. For RVs, we have a large shower. It is equipped with the highly recommended Oxygenic shower head that we installed promptly before hitting the road to increase water pressure. Across from the shower, we have a private 1/2 bath. This space is cramped! 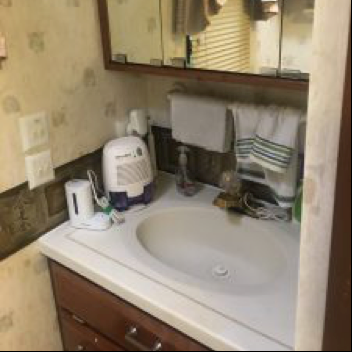 It is downright impossible to brush teeth with more than one person in the room and if you "need" something from the bathroom, you will have to wait until the current occupant has left the area or someone risks being inadvertently punched or squished. My patience wears thin at times and I think I am Elastic-girl and can maneuver around whomever is in bathroom while he or she is bent over the sink with a mouthful of toothpaste mumbling to me "just a minute"...all the while, I try to slip my arm in the cabinet underneath to snag that ever so important item. We do have a "large" overhead cabinet. Yes, there is that large word again. It does allow for additional storage! However, opening the cabinet after driving to a new campground does prove treacherous for the unlucky individual who braves the task. The toilet is not my favorite item in our coach. As you can see, the commode fills the space. It also requires maintenance. What you say? Yes, when we dump our tanks, we have to pour a powdery white substance that helps break down its contents as it is filled up. When we use the toilet, we have to fill it with water to help the solid waste move down the pipes. Here is the inconvenient part. We had the toilet rebuilt recently because the seals had deteriorated and were not holding any water. Now, the seal works "okay". Yes, we can fill the toilet, but that is a temporary achievement. Once the occupant's business is finished, the water has successfully seeped out from the bowl and all that is left is the mass of nastiness that he or she now needs to wash out and down into the tank. The motorhome designers conveniently installed a water sprayer right next to the toilet to accomplish the task. Therefore, this is not a highlight of my day…. In the hallway, we have an extra closet that can be used for a stacking washer and dryer, but our model did not have one installed. I feel blessed to have the extra storage space! This is where we store extra coats, blankets, and shoes. We also use the closet as an emergency space for an "item we do not know what to do with at this moment". 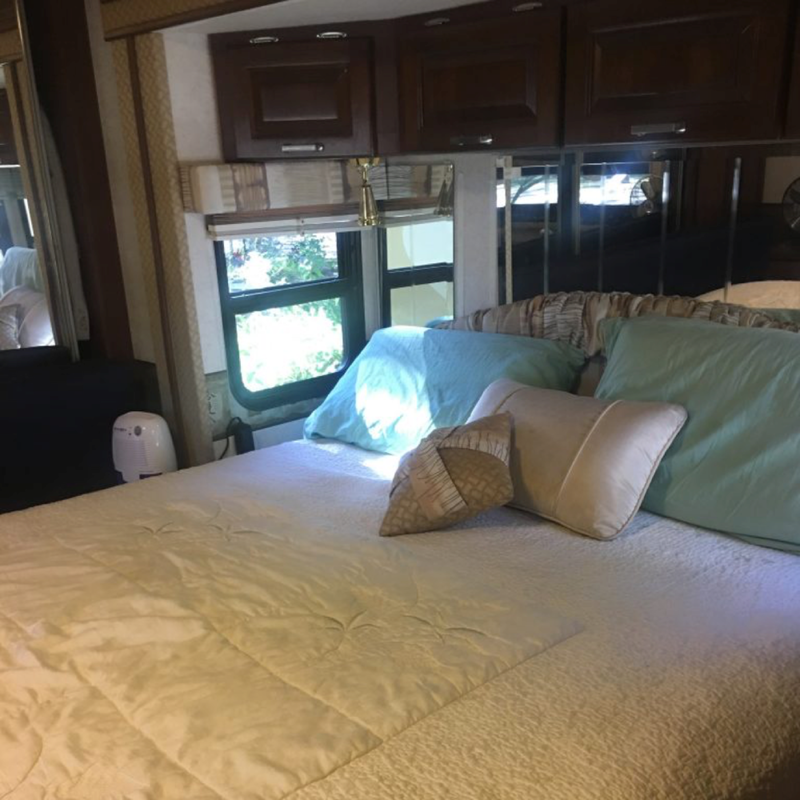 When one lives in an RV, these kinds of spaces begin to appear all over the place because no matter how hard you try, there is never enough space for anything! We are lucky that our girl has so many overhead cabinets, and there are hiding places everywhere...unfortunately, all the nooks and crannies make finding what you need near impossible. I find that we lose more things than when our family lived in a "sticks and bricks" home. One of my favorite hiding places is behind the reclining chair. I have managed to conceal three large bags of crafts, a purse, Chaplin’s bike helmet, our vacuum cleaner, and a couple books. I could store even more behind the chair if I got creative. Both the driver's seat and passenger front seat can rotate 180 degrees, which adds two additional seating areas. However, we only turn the driver's seat around because we cannot hide our garbage behind the recliner if we turn the passenger seat around. Priorities, priorities….RV living is all about compromise! Well, I hope you have enjoyed the grand tour of our magnificent home. Keith, Chaplin and I absolutely LOVE our girl. The Golden Snail has proven to be one of the best investments we have ever made. No, we will not profit from our depreciating asset. In fact, each day that goes by her monetary value becomes less and less. However, every moment we have her our lives become simpler, richer, and filled with the things that matter, which to us, is a life built upon the people in our lives not the stuff we fill it with.